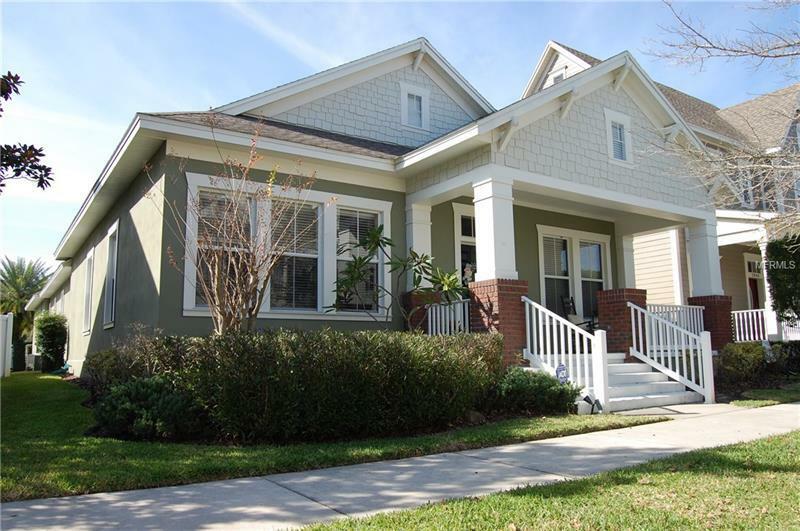 Very popular but RARELY available one-story David Weekley McFarland Craftsman. From the moment you are greeted by the charming front porch youâll know that this is one special home. The interior offers over 2300 SF of flexible living space. 4 bedrooms and 3 bathrooms, flex space for office/den/dining/formal living and a WIDE OPEN kitchen and family room that is flooded with natural light. The home is loaded with upgrades including crown molding, distressed hardwood floors, 8 foot interior doors, stainless appliances, 42â cabinetry and granite. The master suite is generously sized and privately tucked away. Exterior features include a 2 car garage, wrap around rear and side patios and a fenced in back yard. Located just a short walk from the High Park pool and playground youâll be able to take full advantage of community amenities. Baldwin Park residents benefit from being in the highly rated Winter Park school district and amazing community amenities including 3 pools, 2 gyms, trails, parks, play grounds and convenient City Center with its own Publix, CVS and multiple dining options. Donât miss out on this unique opportunity to call this great place YOUR NEW HOME! Schedule your private tour today. Pet Restrictions: Domestic pets only. Buyer to confirm with Baldwin Park HOA and municipality ordinances.